CAP has had an exciting few months and we’re delighted to share some highlights with you. November saw the launch of our 2016 Impact Report at a packed event in Westminster hosted by Tommy Sheppard, MP for East Edinburgh, and with keynote speeches from Home Office Minister Sarah Newton (pictured) and Police and Crime Commissioner Vera Baird. CAP Chairman Derek Lewis gave an overview of CAP’s impact, revealing that in CAP areas alcohol-related youth anti-social behaviour fell by an average 40%; seizures of alcohol from under 18s drinking in public fell by 85%; attempted purchases by under 18s fell by 75% and there were significant reductions (41-65%) in attempted proxy purchase by adults on behalf of children. A high point was the presentation of the National CAP Community Champion Award to Dave Looker, Retail Risk Manager for Sainsbury’s. Regional awards went to Ian Lovie, Licensing and Compliance Manager for ScotMid and Sergeant Mark Pickavance – both of Edinburgh CAP; PCSO Sian Jenkins of South Wales Police; Sue Grief of Ashfield and Mansfield CAPs; Craig Spence, Senior Neighbourhood Manager of Corby Borough Council; Rebecca O’Grady of Ilkley and Clayton CAPs; Helen Cox and Susan Dabbs of Hayling Island CAP; Matt Knight and Tessa Brunsden of Reading CAP; Sgt David Rogers of West Midlands Police; Marguerite Dennison of Swanscombe, Kent CAP. Finally the CAP Youth Champion Award went to Henry Maybury, a young singer songwriter who provides great support to CAPs throughout the UK by performing, speaking and attending events. Following the launch we’ve been asked to organise a number of CAP visits for MPs and officials who want to learn more about CAP. We’re looking forward to telling them all about the great work that CAPs are doing – and arrangements are already in hand to welcome Caroline Flint MP to Conisbrough & Denaby CAP. Councillor Joy Rosser, Cabinet Member for Prosperity, Wellbeing & Communities at Rhondda Cynon Taf County Borough Council launched the Porth CAP at the Pop Factory during Alcohol Awareness Week. The event was very well attended with over 80 delegates in total. The Newtown CAP also launched in November at Newtown Football Club. Singer-songwriter Henry Maybury spoke and showed his music videos, and also performed at the local sixth form college on the morning of the launch. 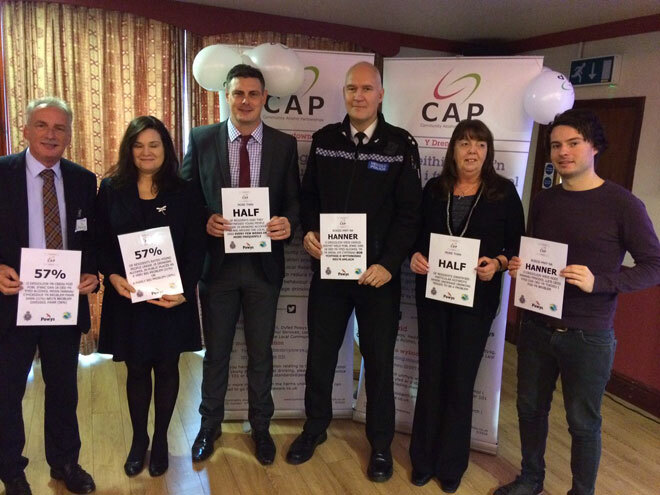 This year has seen three new CAP launches in Wales. We are grateful to the Welsh Government which provided £15,000 of seed-funding. 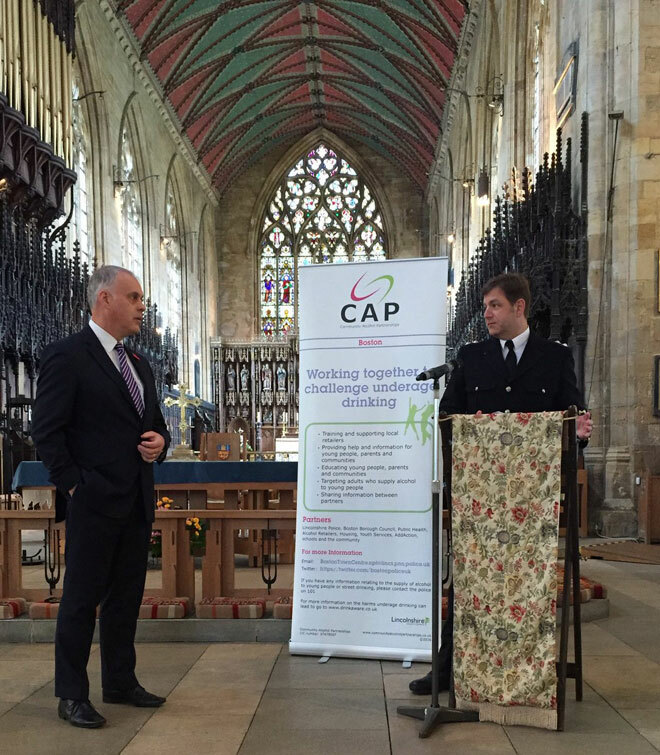 The Boston CAP launched in November at St Botolph’s Church, where speakers included the Deputy Police and Crime Commissioner, the CEO of Boston Borough Council, the Police Chief Superintendent and representatives of Tesco, ASDA and The Co-operative. This new CAP is already looking at a range of actions including compliancy checks followed by licensing workshops, posters in different languages and the use of pavement stencils to deter proxy purchase. Trading Standards are developing retailer information packs; referral schemes are being reviewed and refocused and the CAP is taking a fresh look at what activities are available for young people and how they are communicated. Congratulations also to Ovenden CAP which launched on 10th November 2016. It may seem a long time ago now, but many CAPs used our Halloween poster to great effect. At the Pontardawe CAP posters were blown up to A3 size, laminated and distributed to all licensed premises by the Police. Stencils too are being successfully used outside licenced premises and areas of high footfall. In Blyth the proxy stencil was sprayed outside every off licence and school by Police, and it was great to see this work featured on ITV News. You can see the story here. A new stencil is now being designed by young people in a competition with prizes offered by ASDA. In Castleford a pop up café has been created, which opens up to young people every second Thursday after school; QR codes in Pokemon areas are being created and lesson plans have been created for a Sound of Silence which will be rolled out across secondary schools in the area. This excellent film was created by students at Airedale Academy in Wakefield and highlights the link between alcohol misuse and domestic violence. In Ilkley the first CAP Ambassador has been selected and trained. This young person – who was not in employment, education or training – has now through the connection with CAP been employed by The Co-operative. Also in Ilkley an anti-alcohol misuse poster competition is being run with the youth club and grammar school and an interim youth survey has shown a decline in weekly drinking and a significant number of young people not drinking at all. 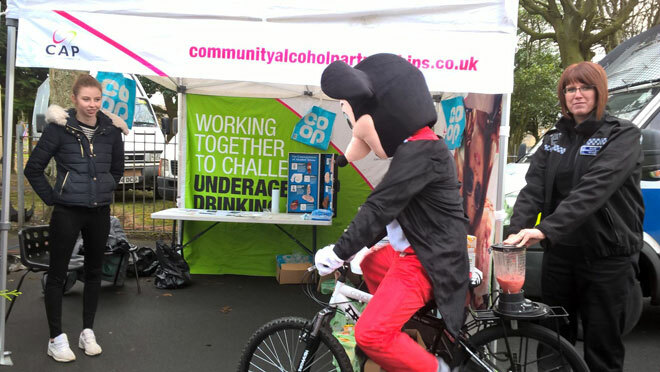 Clayton CAP was out in force at the Dickensian market to attract the attention of young people, complete with Mickey Mouse on a smoothie bike! Meanwhile in Todmorden a Youth Outreach Bus called Bus Oasis has started to pay monthly visits in the area and CAP Educational Resources have been offered to it. In Pontardawe the Police have started to run free weekly football events each Saturday in collaboration with the local leisure centre and there are talks with Swansea City FC about involving their coaches. Following a free licensee training session in Aldershot, test purchases have now been repeated by the Police which resulted in 20 passes out of 24 premises tested. A further training session for retailers, premises license holders and/or DPS has been organised for December as an alternative to enforcement action. Reports of groups of underage drinkers have dropped to very low levels and the CAP is currently gathering data for evaluation. Fantastic progress has been made in Barrow-in Furness in anticipation of launching a new CAP in January. Residents’ surveys have now been completed; three hotspot areas identified where underage drinking and anti-social behaviour is occurring and schools surveys should be completed by the end of December. In Burnley the CAP action plan is now being finalised and a launch is planned for January. This will be the first of several CAPs planned across Lancashire. Plans for launching a CAP in Lancaster are also well developed. Resident, schools and licensee surveys are currently being compiled and a launch is planned for 26th January at the Ridge Community Centre. February will also see an expansion of the East Edinburgh CAP to cover the areas of Leith, Bingham, Magdalene, Niddrie, Craigmillar, Portland and Piershill. We are also looking at launching new CAPs in several other parts of Scotland, including the West Edinburgh (Costorphine and Drylaw), Falkirk and the Orkney Islands. Protecting children from alcohol-related harm is everyone’s responsibility and the festive break is no exception to this rule. A new Christmas themed poster has been created for local CAPs warning adults of the consequences of buying alcohol on behalf of under 18s. We are also planning a major campaign – in conjunction with Drinkaware - next year to deal with the rather more complex issue of parents buying alcohol for their children – whether for consumption at home or to take to house parties. 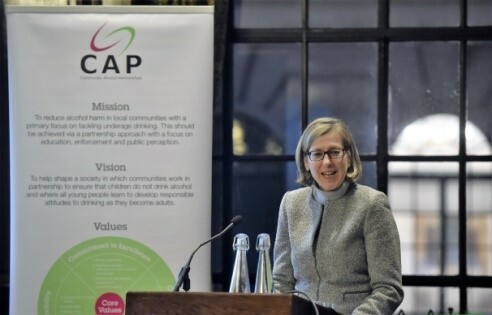 The CAP team is delighted to accept invitations to explain how CAP works and looks forward to working with many more areas to help empower partners to build an effective response to tackling localised underage drinking. Contact details for all CAP staff are below – we look forward to hearing from you. We are now on Twitter at @CAPUKTweets so please follow us to keep up to date with all our activities. From all of us at CAP Merry Christmas and a Happy New Year.